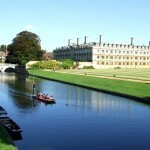 Your are here: Home » Blog » Making the most of your time in Cambridge: Using English outside of the classroom. 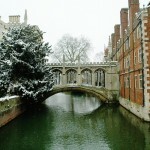 Making the most of your time in Cambridge: Using English outside of the classroom. Our senior teacher Jo has written some great advice on how to use your English when you’re not at school. Here’s what she had to say. The best way to improve your English is to use it as much as possible. If you surround yourself with English, your confidence will grow as you get used to using and hearing it. This will make you feel more comfortable in social, business or exam situations where you have to use English. Your teacher can give you suggestions about what to do in your free time, but the best advice is to do things you enjoy in English and have fun! There are many ways to use English in your free time. Here is a checklist of things you could try. Talk to your host family. If you talk about a different topic every day, you have the chance to practise talking about a variety of subjects. Go to the cinema. You can watch the latest films in English. The Light cinema is a short walk from the school. Some films are shown with English subtitles. You can find out more here: http://cambridge.lightcinemas.co.uk/accessible-cinema/subtitled This is a great way to improve your listening skills, as you can see how words are pronounced, which will help you understand them in the future. Watch TV programmes: You can watch English TV programmes online here: http://www.bbc.co.uk/iplayer , http://www.itv.com/ and http://www.channel4.com/ Some programmes have English subtitles. Ask your teacher or host family for recommendations. Go to a restaurant and order food in English. Go punting. A guide will tell you about local history as you travel along the river. This is a good opportunity to listen to spoken English. Go to a museum. Cambridge has many interesting museums. 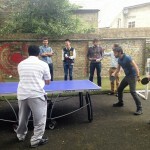 For example, The Fitzwilliam museum http://www.fitzmuseum.cam.ac.uk/ . There is lots to see and read in English. Try volunteering. For example, there are many charity shops in Cambridge. You could volunteer for a few hours a week and practise your English, while getting some work experience. Connect with other students on social networks. You can keep in touch after you leave the school and continue to communicate in English. Travel to another city. You will need to book a hotel and transport in English. Go to the pub and order drinks in English. Join a gym class. You can meet local people while getting fit. Take part in a language exchange: Find someone who wants to learn your language and meet up with them. You can speak in English for half the time and your language for the other half. Read a magazine/ newspaper/ online article: Find something you are interested in and read about it in English. Regular reading, for example for 10 minutes a day, will help improve your English. You are more likely to keep this habit if you read things that interest you. Your teacher can advise you on where to find articles that match your interests.